Father David Lawler is the associate pastor of St. Christopher Parish in the Indianapolis West Deanery. He is 74. Born in Richmond, he grew up in St. Mary Parish there, attended St. Mary School and graduated from the former Saint Meinrad High School in St. Meinrad. He studied theology at the former Saint Meinrad College in St. Meinrad, the former St. Mary College in Lebanon, Ky., and St. Maur Seminary in South Union, Ky., then was ordained to the priesthood by Archbishop Paul C. Schulte on May 6, 1962, at Saint Meinrad Archabbey Church. 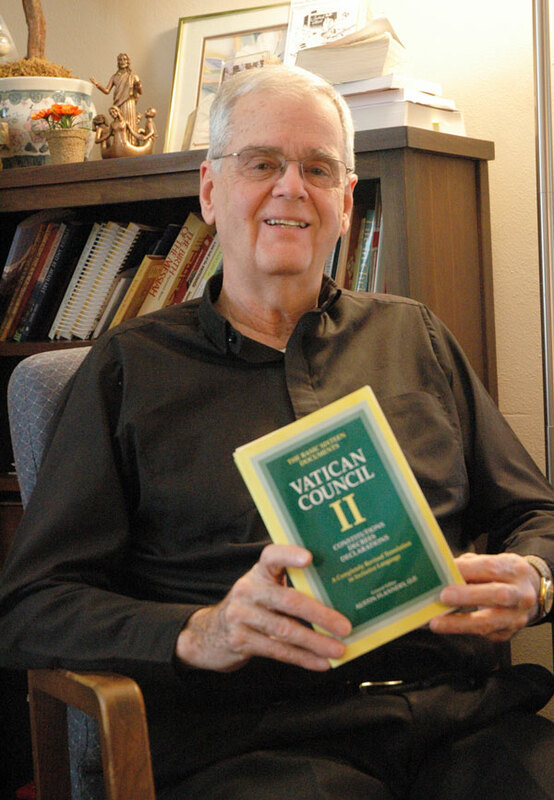 Vatican Council II priest—During a March 10 interview in his office at St. Christopher Parish, Father Lawler talked about his ordination to the priesthood at the time of the Second Vatican Council in Rome. Father Lawler smiled as he paged through a bound volume of the council’s decrees, which he keeps with his other reference books. “These are beautiful documents,” he said. “They are very easy to read. The Church changed dramatically during the 1960s. Vatican Council II changed everything from the liturgy to involvement by the laity to ecumenism. Pope John XXIII, who convened the Second Vatican Council, is one of Father Lawler’s heroes in the Church. Focus on racial equality—The 1960s were historic years for the international Catholic Church with the Vatican Council, and historic years for the civil rights movement in the United States. In 1965, while he was serving as associate pastor of St. Joan of Arc Parish in Indianapolis, Father Lawler and several other priests responded to Father Raymond Bosler’s invitation to march in support of racial equality with Dr. Martin Luther King Jr. in Selma, Ala. Participating in that civil rights march changed his priestly ministry, Father Lawler said, because he felt called to preach the Gospel message of equality. Years later, while serving as the pastor of Immaculate Heart of Mary Parish in Indianapolis, he marched for racial equality again with other priests and Protestant ministers outside a segregated swimming club then later testified in a federal deposition on behalf of a discrimination lawsuit related to the club’s restrictive membership. Cardinal Joseph E. Ritter, a former archbishop of Indianapolis, is another Church hero, Father Lawler said, because he integrated the Catholic schools in Indianapolis and St. Louis. Two priests in the family—Father Lawler’s older brother, Richard, also answered God’s call to the diocesan priesthood. Father Richard Lawler was the pastor of St. Mark the Evangelist Parish in Indianapolis at the time of his illness and then his death on Aug. 9, 2001. During his nine-year battle with cancer as well as after his death, many diocesan priests and lay people supported the Lawler family with prayers, which still means a lot to Father David Lawler. Parish ministries—Father Lawler enjoyed his early pastoral assignments at St. Andrew the Apostle Parish, St. Joan of Arc Parish and Immaculate Heart of Mary Parish, all in Indianapolis, and St. Ann Parish in Terre Haute as well as 21 years of ministry as the Catholic chaplain at Methodist Hospital in Indianapolis, the state’s largest hospital.